In 1207 a daughter was born to pious King Andrew II of Hungary. She received the name of Elizabeth in baptism. The child, Saint Elizabeth of Hungary, was so lovable that the wealthy landgrave of Thuringia and Hesse sought her as the bride of his eldest son Louis. His request was granted, and a solemn embassy went to get Elizabeth, then only three years old, so that she could be raised at her future husband's castle. The two children loved each other like brother and sister, and vied with each other in acts of piety and charity. Those who beheld Elizabeth at prayer might well have believed they saw an angel. Her greatest joy was to give things to the poor. When she grew a little older, she visited the poor and the sick, and waited on them with as much reverence as if she were serving Christ Himself. The proud dowager Landgravine Sophia was displeased with Elizabeth's conduct and endeavored to talk her son into sending Elizabeth back to Hungary and choosing a bride of more princely ways. But Louis was aware of the treasure he possessed in Elizabeth. Succeeding his father at the age of 18 he took over the government and married Elizabeth. Their marriage was unusually happy, and Louis gave his wife full liberty to do all the good her heart desired. At Eisenach Elizabeth built a large hospital. 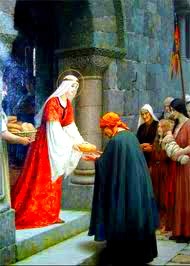 During a famine Saint Elizabeth of Hungary daily fed nine hundred needy people. The story is told that once when she was on her way with her cloak full of good things for her dear poor and sick, she met her husband, who teasingly blocked her path until she would show him what she was carrying away this time. How astonished was he to behold fresh, fragrant roses in midwinter. Reverently he permitted his spouse to go on her charitable way. "Dear Elizabeth, you may always receive guests like that. I shall even thank you for it." But Saint Elizabeth of Hungary, too, was to be tried by the crucible of suffering. Emperor Frederick II set out on a crusade to the Holy Land in 1227, and pious Landgrave Louis joined the expedition. But he died on the way, in southern Italy. When the news reached Thuringia, Louis' brothers rose up against Elizabeth. Saint Elizabeth of Hungary was driven out of the palace; only two faithful maids went with her. In Eisenach the people dared not give her shelter fearing the resentment of the new masters. It was midwinter and night was at hand. The daughter of a king, a widowed princess, with four little children, the youngest scarcely 2 months old was completely destitute and homeless. A man finally offered her shelter in a stable. Grateful for the kindness. Elizabeth thought of how the Son of God on coming down from heaven, was refused admittance at all doors of Bethlehem and found refuge in a stable. The thought filled her with greater joy than she had ever experienced in her palace. At midnight, when the bells of the nearby Franciscan convent, which she had built, announced the chanting of the Divine Office, she begged the friars to sing the Te Deum in thanksgiving for the favor that she and her children were made so like Jesus. With her faithful servants, Saint Elizabeth of Hungary now arranged things as best she could. She spun flax for a livelihood, saving something from the meager income to give to the poor. Later Elizabeth was reinstated in the Wartberg, and Emperor Frederick II, whose wife had died, asked her hand in marriage. But Elizabeth had so learned to love poverty and seclusion that she had no desire for worldly greatness. Her children were given the education due to princes, but she and her two maids repaired to a small house near the Franciscan church in Marburg. Elizabeth had joined the Third Order of St Francis during the lifetime of her husband. Indeed, she was the first member in Germany, and received a message from St Francis himself. Now, vested with the habit and the cord, she led a quiet religious life, meanwhile nursing the sick in the hospitals, and submitting her whole life to the direction of the learned and devout Friar Conrad. Our Lord announced to her that He would soon call her to heaven. She told her Father Confessor, who had fallen seriously ill, that he would recover, but that she would die soon. Within 4 days she became ill, and was prepared for her final hour by her confessor, who had recovered. "her face became so smooth, so majestic, and so beautiful, that this sudden change could only excite admiration; and one might say that death, the ruthless destroyer of all things fair, visited her but to obliterate the traces of sorrow and austerity, as if that grace which hitherto replenished her soul, would now in turn animate her body." It is said that the saint was far more lovely than any of the representations of her. The miracles that took place at her tomb were so numerous that Pope Gregory IX canonized her already in 1235. Saint Elizabeth of Hungary is the special patroness of the sisters of the Third Order Secular of St Francis, and also of some religious sisterhoods of the Third Order Regular. Pope Leo XIII placed all charitable organizations of women under her patronage.